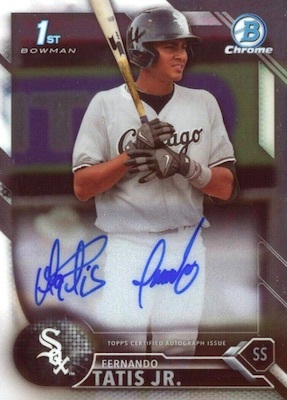 As one of the top-rated prospects heading into the 2019 season, Fernando Tatis Jr. rookie cards have already jumped quite a bit in the early part of his MLB career. 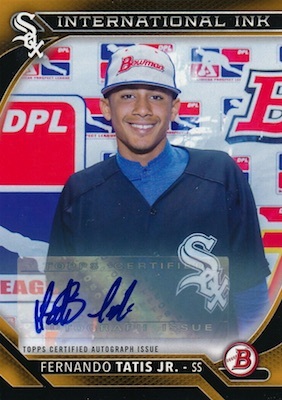 Born in the Dominican Republic, Tatis signed as an international free agent with the Chicago White Sox in 2015, but was traded to the San Diego Padres in 2016. He spent a few seasons with the Padres' minor league affiliates before making the move to prime time. Following his MLB debut on March 28 (Opening Day), the rookie card needle moved from "if" to "when." 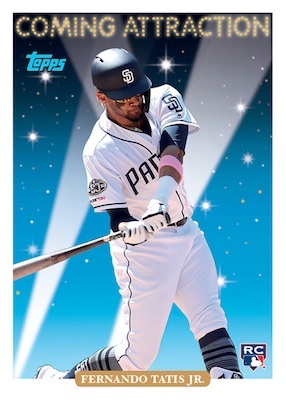 Topps has not indicated when the first pack-pulled Fernando Tatis Jr. rookie cards are planned, but they should arrive at some point during the 2019 baseball card season. However, there are still notable options to add to your collection, including his initial Bowman Chrome cards from 2016. 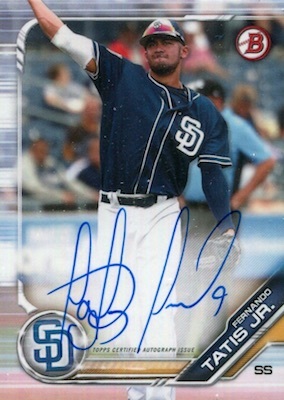 See available Fernando Tatis Jr. cards with the most bids on eBay. All the Fernando Tatis Jr. rookie cards are shown below along with his key prospects. If you are looking for signed memorabilia, Topps has a solid selection. Check back for updates as new cards are released. 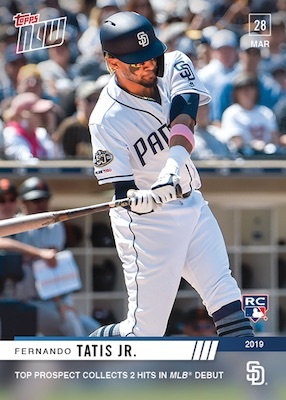 While not pack-pulled, 2019 Topps Now Baseball offers the first Fernando Tatis Jr. rookie card with the RC logo. It was issued in honor of his MLB debut and sold 3,061 copies. There is also a limited Now on-card autograph with a game-used base relic from the same date. This version is numbered to 99 with several low-numbered parallels. While the main edition (#/99) originally sold for $149.99, the collector that took home the one-of-one card paid $2,999.99. Another print-to-order card arrived in 2019 Topps Throwback Thursday. 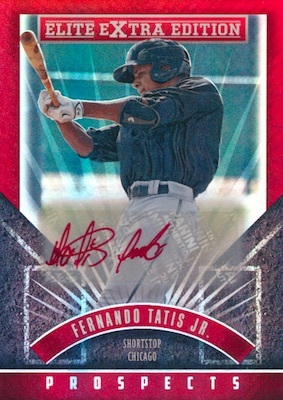 Although it has the same image of Tatis as his first Now offering, the design is taken from the Coming Attraction cards in 1993 Topps Baseball. The six-card set includes key rookies from the 2019 season. EEE does not carry the same weight as Bowman Chrome, but there is still value in being first. This 2015 Elite Extra Edition card comes in a base version and with a sticker autograph. Most cards are signed using red ink. There are versions with green ink, but these are much less common. When something has "1st Bowman" noted on the card, collectors take notice. This was the case for Tatis' Bowman Chrome Prospect card in 2016 Bowman Baseball. 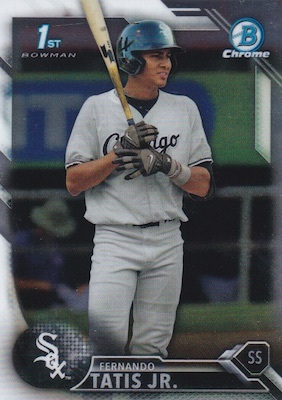 His base card with the Chicago White Sox is very affordable and the many Refractor parallels provide rarity and higher prices. He also has a paper version with a few parallels. Another notable choice is the International Ink autograph in the same set. Numbered to 99, these were ultimately the appetizer ahead of the main Bowman course. The real treat for collectors came in 2016 Bowman Chrome Baseball. This hard-signed autograph is the top Fernando Tatis Jr. card to own. It is one that sees the most attention and highest values. On top of that, the parallels offer even more to chase. 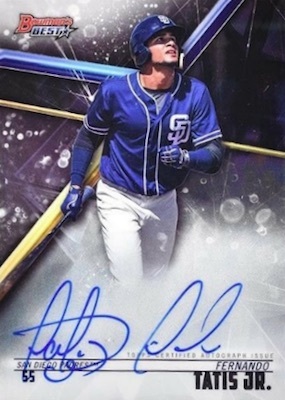 Arriving a little later to the game, the on-card 2018 Bowman's Best autograph for Tatis is an affordable substitute if the 2016 Bowman Chrome card is out of reach. The parallel rainbow is smaller than BC but there are several Refractor editions that yield strong prices. Another key aspect for some is that it features Tatis with the Padres. Provided at Topps' annual convention for card shop owners in 2019, there are three different poses that each carry a print run of 50 copies. This includes a running image, batting pose and what appears to be a mid-throw photo. I guess he could be vigorously waving. In any event, all three styles are hard-signed. 2018 Bowman's Best Top Prospects Green Refractor #TP-24 Fernando Tatis Jr Jr.
Can we really count Topps Now? Is it safe to assume we’ll get a FTJr and Eloy in Topps Series II? To me those are the rookie cards. I would expect Tatis and Jiminez will be in Series 2 but we won’t know for sure until the checklist comes out. I typically enjoy your articles. However, on this one I will say that none of these are rookie cards. Instead they are prospect cards. Fair enough. Collect what you enjoy.